Various templates and markers for use with the Warhammer game. Seven different types with varying sizes, colors, and shapes. 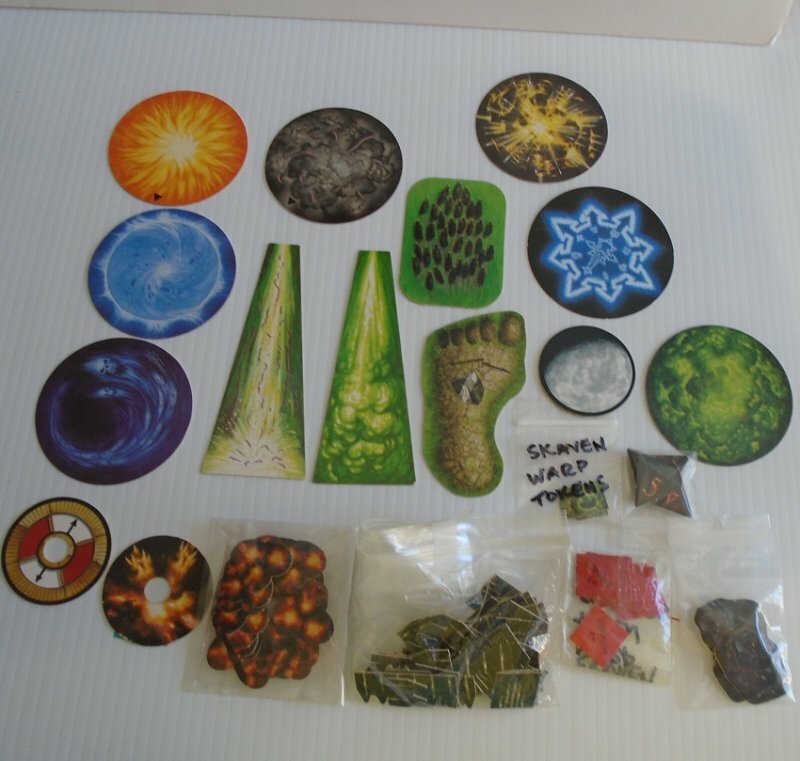 Offered in this listing are 7 different types of templates and markers for the game of Warhammer. The items are multi color and are made of a thin yet sturdy cardboard type of material. Of the 7 different larger templates, I was able to determine that some are called Pestilent Breath, Stream of Corruption, Da Krunch foot, Vermintide Square. Of the smaller pieces, I determined them to be Battlefleet Gothic blast markers, Skaven Warp token counters, and Skaven Warp tokens. There are 3 types that I could not figure out at all. These 3 are about one inch in size (or just a little bigger). Quite a few years ago I purchased a storage unit at an auction and in that unit were several good size boxes of Warhammer figurines and accessories. There had to be several hundred figures. I had no idea what these pieces were or what game they belonged to, so I packed them up and they've been sitting in my garage for eight or nine years now. Then, a couple of weeks ago I was out going to yard sales and a fella was selling about a dozen of them. He finally told me what I have. I've spent hours and hours on google since then trying to determine if they have names and what to call them. I will be selling them all in lots of different types and amounts. But I'm still struggling with what to call most of them. I'm sure that the titles that I assign to each lot may not make a lot of sense to you buyers, but it's the closest thing I could come up with. I suspect when I get them all listed there will probably be over 100 lots listed, so please be sure to check my other listings. Buyer to pay $4.75 USPS First Class Mail Package shipping charges. Shipping is from Arizona. I do combine shipping on multiple items purchased as long as all items will safely fit into a single box. However, my web host is not set up to calculate multiple item shipping costs. At checkout, you will be charged full shipping price on each item purchased and I will refund the appropriate amount of overpayment. If you are uncomfortable with that, you can send me an email with your zip code and stating which items you'll be purchasing and I'll calculate the correct combined shipping charges and send you a custom invoice.